Looking for Pecan Pie recipes? You've come to the right spot. These pies have always been one of my favorite desserts. In fact my grandmother (Nanny) would sometimes send one to me at college (about 300 miles away) via a roommate. I would consider hers to be the best recipe, but I may be biased. The content of this section of our site contains several recipes dug up by my wife. She gathered them from family, old cookbooks and other sources. She has cooked them herself, documented the process and commented on each one as she went. It is all captured here. She guides you in the fun of how to make a great pie. Whether you are looking for an easy recipe, a centerpiece Thanksgiving pie, information on the classic pecan pie or a delicious Christmas dessert, you should be able to find it here. We have a collection of southern recipes that will satisfy any sweet-tooth. Below is a list of the recipes Tori has gathered so far. Check back often as she adds more to the list. 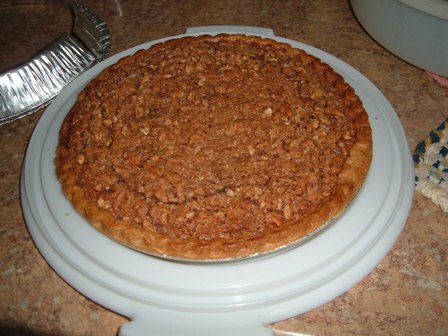 Best Pecan Pie Recipe Tell us about your recipe!!! !